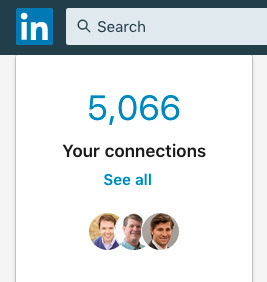 Only months ago I had 738 contacts on LinkedIn. Just cracked 5,066. How’d I do it so fast? During my outreach to connect, I don’t sell. I offer a brief background on my expertise, then I offer to share that expertise. I’ve met so many amazing people along the journey. A few even in-person for coffee. All of them kind enough to share their adventures with me. I also met a retired gentleman named Sam that told his life story. About how him and his partners wanted to start a new business. They did some research and decided on a dollar store. I asked why a dollar store when that wasn’t in his background. But none in the Rocky Mountains. So he built a dollar store chain and a few years later it sold to that national chain because they recognized the value in filling that geographical gap. At the end of the day, it’d be a lie to say that most everyone on LinkedIn isn’t into networking for some selfish reasons. But what may have started months ago as a goal to increase business has long been overshadowed now by the rewards I get by meeting new people and hearing their stories.